On Saturday night, the none-more-rock-named Stone Distillery Fermenting Cellar in the Distillery District played host to the Ukula Bright Lights festival. It pulled together an interesting bill of domestic and international talent for the purpose of, well, I’m not entirely sure. But more on that later. The Fermenting Cellar isn’t actually a cellar, but a large warehouse dealie with a nice, turn-of-the-century vibe and unforgiving concrete floors. For the event, the organizers had erected a low stage at one end, indicating it was going to be a cozy, intimate sort of evening rather than a big high-faluting rock show. Nice. Initial schedules indicated that sets were going to run from mid-afternoon all the way into the wee hours of the morning, so in the name of practicality, I planned to arrive early evening and just catch the bigger names perform. I also thought I’d be able to miss Stirling, whom I’d seen before and had no great affection for, but my carefully-laid plans were sabotaged by some last-minute schedule juggling and I arrived just in time to catch their whole set. For the record, I still found them overwrought, melodically deficient and just overall dull. I’d have rather seen any of the acts I’d missed – The Call Up, The Coast or The Empires, though it’s still not clear to me if they actually played or not. Next up were Toronto/Missisauga’s own Meligrove Band. I saw them last year opening for Ted Leo, and they’ve had a pretty big year in the interim – most notably, signing a worldwide deal with V2 as the label’s first-ever Canadian signing. And while they were still had the super-high energy live show and hooks galore, I think I detected an extra level of sophistication in the new material that’s hard to put a finger on. Something about the vocals, either the melodies or the range that Jason Nunes is singing in… it was intriguing – like there could be more to these guys than just the power pop. We’ll have to see when their new album Planets Conspire comes out next January (or you can listen to a good chunk of the album on their website right now). I was never really able to get into The Unicorns, so the reincarnation of 2/3 of that band in Islands wasn’t getting me as excited as some. Still, where there’s smoke, there’s either fire or a smoke machine so I was pretty curious to see what Islands had to offer. For starters, numbers. In the fashion of all things Canadian right now, Islands numbered seven on this evning, including ex-Unicorns Nick Diamonds and J’aime Tambeur, local hero Jim Guthrie on guitar, two violinists and a rhythm section. Musically, there was still a definite goofy vibe (sample song title – “Don’t Call Me Whitney, Bobby”) but the arrangements and musicianship was a lot tighter and refined than what I remembered of The Unicorns and there was a definite and surprising delicacy to a lot of the material. It’s hard to offer more insight than that on a band you’ve never seen or heard before and based only on a short live set, but I’m definitely interested to hear more. This was Islands’ first Toronto show, but they’ll be back on December 1 for a show at the Drake Hotel and their debut album Return To The Sea is out in January. And as a sidenote, like Toronto’s Ladies & Gentlemen, Islands appear to have adopted an all-white stage uniform. I predict a sartorial throwdown in the near future. There can only be one. London’s Duke Spirit have been getting some buzz in their native UK, which in and of itself isn’t all that remarkable since everything in the UK gets some buzz, but it says something that someone was willing to fly them across the Atlantic to play just two Canadian shows, this one and another in Montreal. The Duke Spirit made the most of their Canadian debut as frontwoman Liela Moss, possesing no shortage of Debbie Harry-ish sassy stage presence, led her band through a set of aggressive, abraisive, thundering rock’n’roll from their album Cuts Across The Land that by the end, made believers of most of the initially reticent crowd. Think PJ Harvey, White Light White Heat-era Velvets and old-time soul music. I don’t know if the energy of the live show translates on record, but these Brits definitely know how to work a stage. Like The Duke Spirit, this show was just one of a pair that Manchester’s Elbow were playing in North America in support of their latest, Leaders Of The Free World. 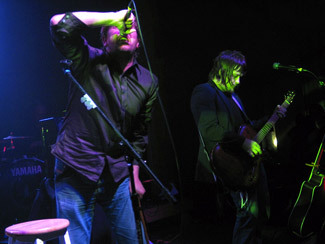 Frontman Guy Garvey was nursing a wounded foot/ankle/lower extremity, thus limiting him mostly to sitting on a stool, all rumpled-like, with occasional bouts of hobbling around stage while waving his cane around, grumpy old man-style. But for the most part he seemed to have accepted his limited mobility with good grace, opting to chat with the audience about this and that between songs. Their set covered what I assume was all points of their discography – I only recognized the Leaders material, so naturally I thought it came off best. While everything featured Garvey’s rich, dramatic vocals and lush musical backing, I felt the new stuff had the most energy and dynamics. The other material came off kind of same-y. I suspect I was in the minority in that opinion, as most of the audience appeared to be devout Elbow fans, rapt at seeing the band live for the first time in three years. Still, I enjoyed it though with Garvey hobbled, the band didn’t offer up much of a show to look at, especially following the energy of The Duke Spirit. As I mentioned before, the title sponsor for this event was Ukula, which I think is a magazine. I say I think because for a title sponsor, they had absolutely no presence at the vent. No posters, no sample issues, no information… and I really would have liked to find out a little bit more about the good folks who put on this event. But maybe the low-profile thing is part of their modus operendi, because the show itself – for all the big and buzzy names on the bill – was surprisingly and kind of disappointingly poorly attended. By my estimation, the hall – which is specced at a 700 person capacity – wasn’t even half full during Elbow’s set. You could have put the whole festival in Lee’s Palace and had room left over. That did give the night a nice private party sort of vibe, but for something billed as a festival, I don’t know if that’s what the organizers were going for. In hindsight, I don’t remember seeing a helluva lot in the way of promotion for this event, which is odd because it could not have been cheap to bring the UK acts over here to play. But hey, didn’t come out of my pocket. I just wonder whose pocket it was, and were they happy with the outcome? Photos? Oh my golly, yes. For a temporary stage setup, the lighting was excellent and thanks to the, er, modest crowds, getting up front was dead easy. We were also very impressed for the two-haiku-for-the-price-of-one footnote. I thank everyone for their submissions. We’ll have to do this again sometime. Think limerick. Dirty limerick. Yeah, today is all Ukula. It was a lot to absorb and try to report back on. I’m tired. Regularly scheduled programming returns tomorrow. Leaders of the Free World has taken me a bit of time to digest, but Asleep and Cast of.. had instant attraction making my "Best Of" lists each year. Also, the Coldplay comparisons mentioned on this blog and by other critics is totally false — Guy Gravey can actually sing and doesn’t do that falsetto ‘ooh ahh’ crap every five seconds. Yes! Yes! The Duke Spirit so rule. Without Elbow" Is this even 5-7-5? Sounds more like 5-8-4 to me? I put the line break in the wrong place when transcribing. good news about islands coming back here soon. it was a good lineup, but the price threw me off. it was a good price for all them bands but at the same time since im not crazy over one particular i did not see myself spending the money. altough maybe i would have if jens lekman had not been playing the same night. I also found Elbow rather same-y after a while, especially given the dirgelike tempo of most of the songs. I hadn’t read any Coldplay comparisons before the gig (this was my first exposure to Elbow, but that’s pretty much what went through my head), they are better sure, but something about the overall mood of the music is similar. My friends however said it was brilliant, and that you had to know the songs. Dunno. I loved Islands, the violinist on the far right was immensely charming, and thought Duke Spirit did a great set. Liela was FIERCE, though I’m not sure how good the songs themselves are. Good to see a mention of The Duke Spirit on this site. They are just brilliant. Saw them upstage British Sea Power earlier this year in London, UK.